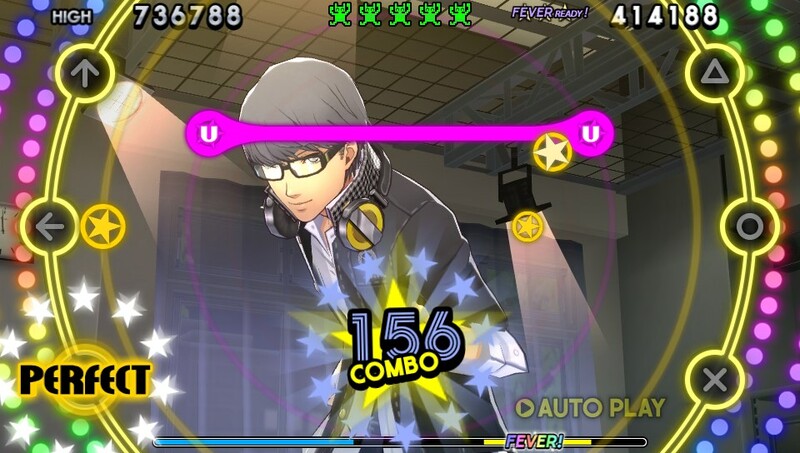 Persona 4 Dancing All Night is a rhythm game similar to the Hatsune Miku games. The gameplay works as follows, press the buttons as they cross over their respective prompts on the screen. Sounds easy, right? That is where you are wrong, you need to time your button presses with the music, and you have to manage sometimes almost a dozen symbols flying to their respective prompts at any one time. For those who are not rhythm game veterans I would recommend playing on easy so you can get a good feel of how the game plays. Even on normal you may have a hard time with keeping up to the rhythm of the game. But in all honestly this isn’t a bad thing, the game rewards you for practicing, and is very generous when you miss a note. However, if you want to keep a long combo of notes going you’re going to want to make sure your timing is as close as possible. With enough practice you’ll be “King Crazy! !” in no time. 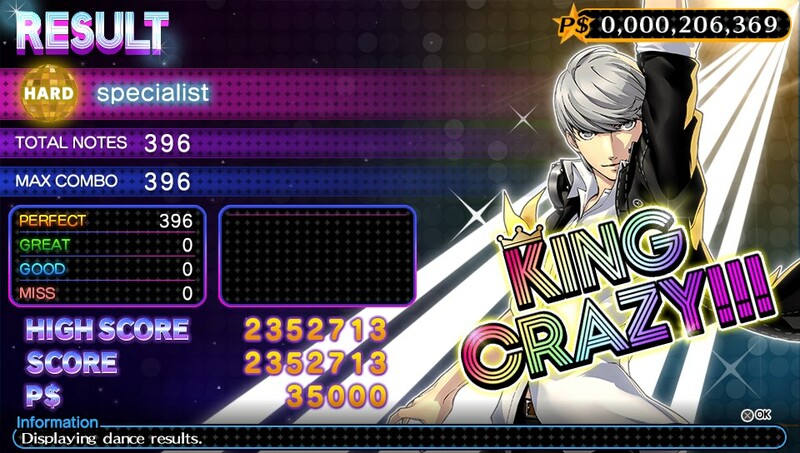 My only issues with the game are the overall layout of the button prompts, and the character voices during songs. To start, we’ll talk about the layout of how to play this game. You make use of only three face buttons on each side of the vita, while using the circle sticks to perform scratches (giant rings that come on screen), to mimic this set up the prompts are on opposite ends of the screen. This is different from games like Hatsune Miku where the prompts appear on screen in sets, or in Rythmtheater where they are coming at you in certain lines. You must constantly keep track of both sides of the screen to manage the notes that are coming at you. I feel like I may have gone almost cross-eyed at times on higher difficulties. However, once I got used to the set up I was able to play all of the games on rhythm. Honestly, that was an awesome feeling, I felt as if I became one with the songs in a way. Each track in this game just feels well-crafted and fits the setting of this game. Next we’ll talk about the character voices. I have to say the voice acting in this game is top notch, as with most Atlus games. However, my only gripe with it is that during a dance, characters will have conversations with each other. This is known as a social bond (this games equivalent to social links), which are fine, I don’t mind them too much at all. They add a layer of depth to playing through the song and the encouragement of doing well is nice. What’s not nice is when you start messing up and your team mates try to encourage you off screen. This at times can become borderline distracting when you are trying to regain your focus on the rhythm after getting thrown off. 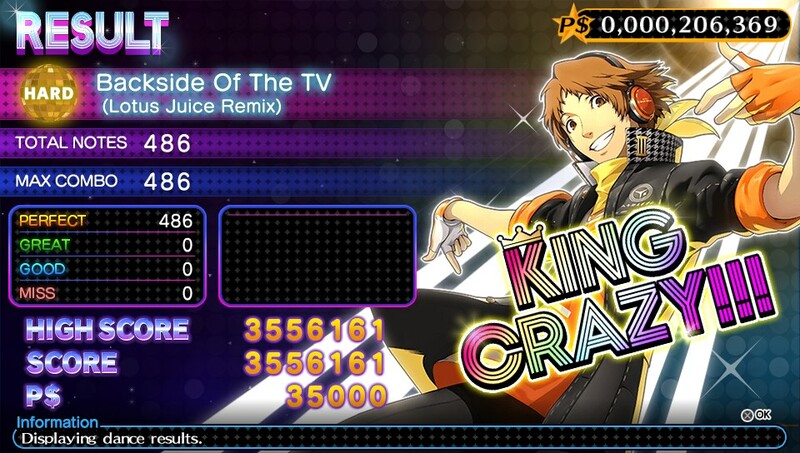 Kanji yelling at me “Don’t choke!” after I missed a couple of notes normally lead to me choking after all. Thankfully, this is a setting you can turn off in the games option menu. Now let’s talk about the second major part of this game, the story. The games story structure is similar to that of Arena and Ultimax where you are playing through a visual novel experience, only to be broken up with battles against shadows with music. However, unlike Arena and Ultimax, this games story is very linear in certain regards. This by no means undermines the story. 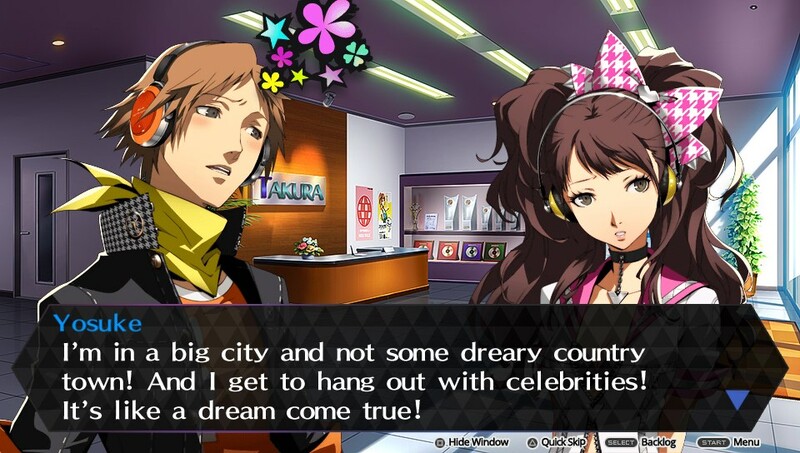 I dare say that this games story is more of a continuation of Persona 4 than what Arena or Ultimax were. This games story tackles themes very similar to that of the original game and, honestly, it’s a welcomed change of pace to end the Persona 4 arc with where it started, storytelling wise (what do you mean by this? Does the story end where it started?). The character interactions in this game are also humorous and well written, none of the dialogue between the investigation team feels forced. You can sense a lot of development in these characters as the game goes on, showing they have kept a lot of the things they have learned over the last several games. However, at times there are instances where the story can drag on to a painful A-B-C format for a little bit. Thankfully, it rewards you once you get past that to some of the best story telling I have seen all year. 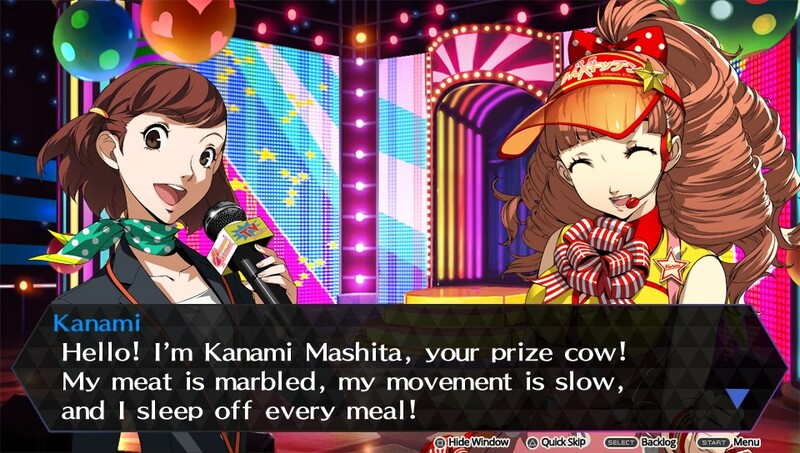 The next good thing about the story is how they incorporate dance battles. I am trying to do my best not to spoil anything for you in this game, but I will say shadows can only be beaten by music in this world that the Investigation team finds themselves in. Each song used fits perfectly for that part of the story, you can tell that the games story was written around the songs used and not the other way around. Also, the new cast of characters this game introduces are a welcomed addition to the series. Each one is memorable in their own way and they stand out greatly. This is more so of an issue I had with Arena and Ultimax where characters like Sho and Labrys honestly did not stand out much to me, but Kanamin’s character left a lasting impact on me. Overall, this games story is very superb and fits very closely to Persona 4’s story. There were also some themes in this game that I honestly thought belonged in Persona 3 as well. Like I said, the flow at times can stutter a bit but it’s not afraid to put you right back into action and have you wondering “What’s next?” It keeps you on the edge of your seat. 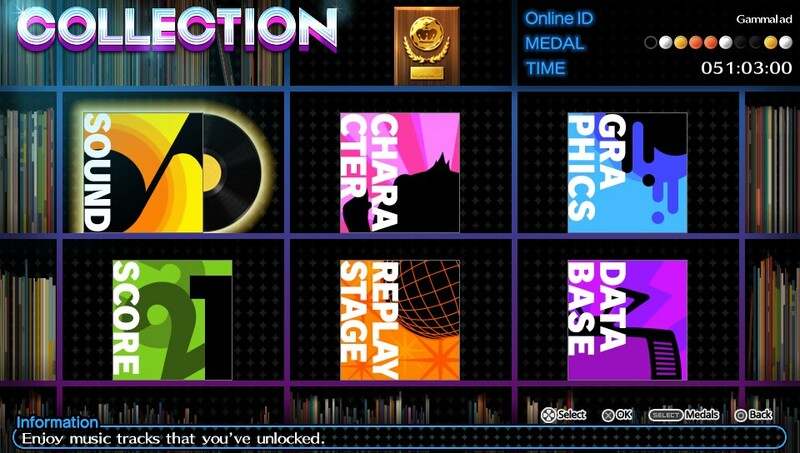 For a Rhythm game, I was really surprised with how much went into this games 20+ hour story. I should mention that if you decided to play through the story mode first you would not be able to unlock song. They all have to be unlocked via Free Dance mode. Finally, I want to address the games content and replay ability. 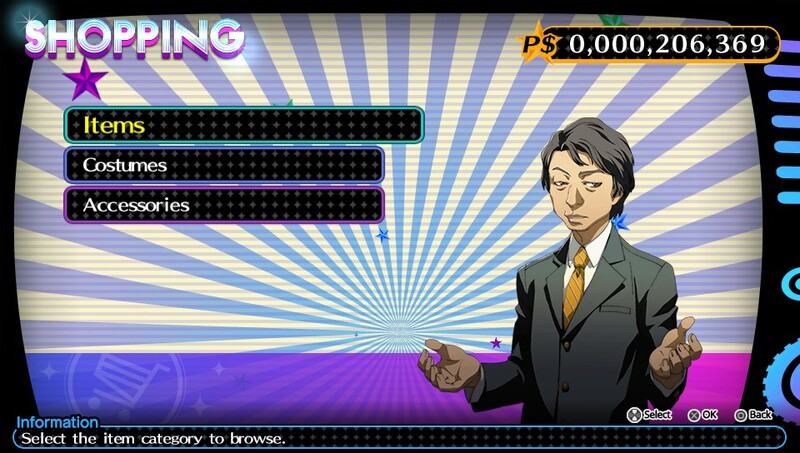 While the amount of content at first doesn’t seem like a lot, this is where our friend Tanaka comes in. 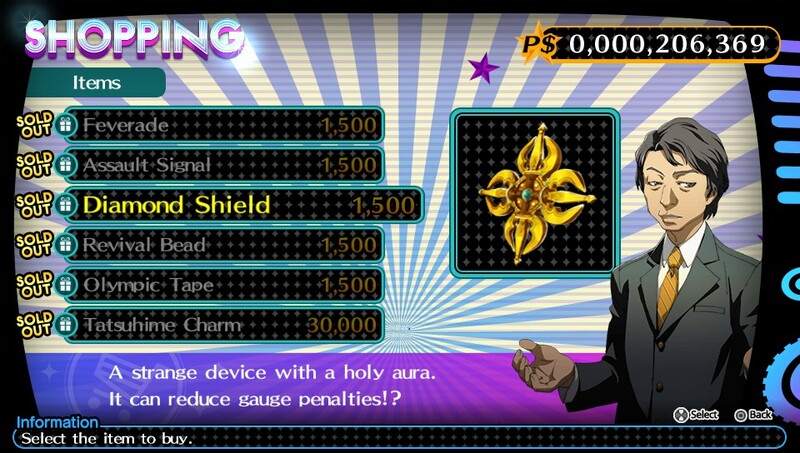 After each song you earn a bit of money which you can use to buy costumes and upgrades from Tanaka’s Commodities. Like I said earlier, this game can be a bit difficult at first for newcomers. Luckily, Tanaka sells items that can make clearing harder songs a little bit easier at the expense of your points and some of your cash. On the flip side, you can buy items that make clearing songs even harder, such as making notes appear faster, slower, or not at all! By clearing these challenges you are able to get even more points and money to unlock things even faster. I dare say some of the items make some of the songs note patterns a completely different song all together meaning that you can play one song in several different ways. Lastly, the game also has a large amount of stuff in the “Collection”. This is where you can listen to all the songs you unlocked in a very cool radio room, effectively turning your Vita into a MP3 player. You can also browse through character art, see online leaderboards, see your own personal leaderboard, read character bios, and even unlock in-game achievements separate of the PSN ones. I found myself using the radio feature quite a lot on the bus to my classes. In short, there is a lot to see and do in this game to keep you coming back to test your skills. 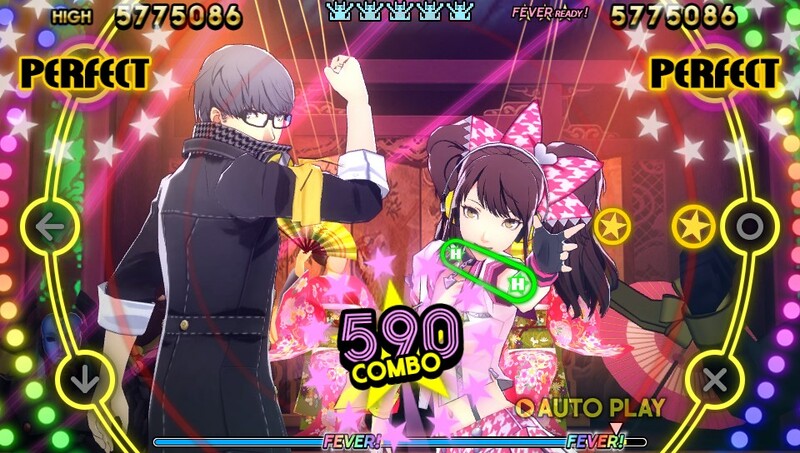 Overall, Persona 4 Dancing All Night is an excellent send off for the Persona 4 cast as we venture into Persona 5. Despite the game having only 26 tracks (a small amount compared to games like Hatsune Miku) the game makes up for it with its enticing story, and the ability to play each song in several different ways adds a lot of replay value to each individual song. 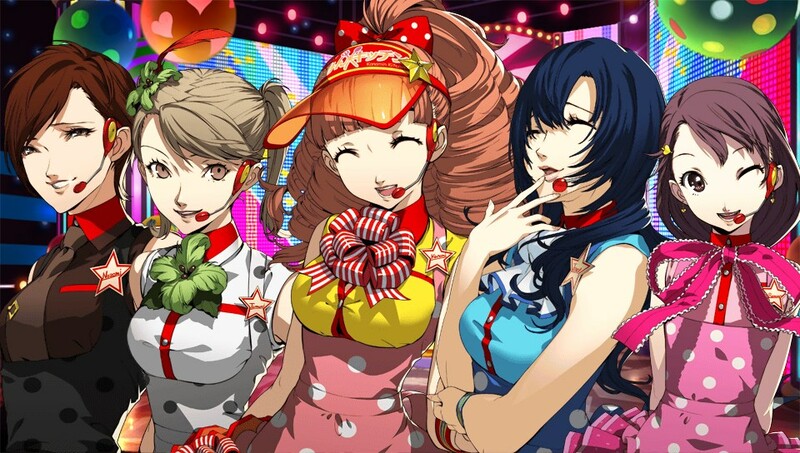 So for Atlus’s first attempt at a rhythm game they really hit the ground running! 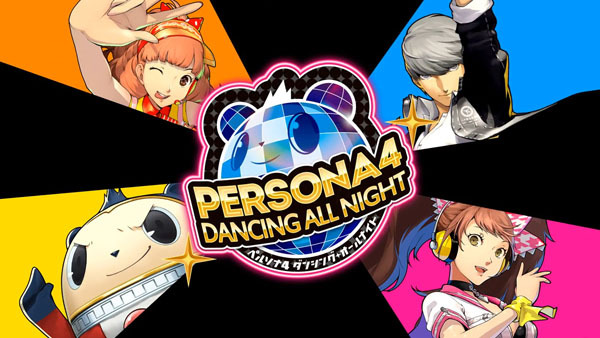 Here’s to hoping for Persona 3 Dancing All Night soon. Posted on September 22, 2015, in Reviews and tagged Atlus, P4D, Persona, Persona 4, Persona 4 Dancing All Night, Rhythm, Vita. Bookmark the permalink. Leave a comment.